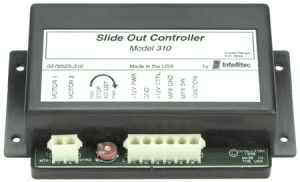 Complete Name: Intellitec Controllers Brief Information: Slide Out Control Module 310 Complete Overview: Intellitec's Slide-Out Controller's are a part of the expanding family of the MONOPLEX™ System. These controllers are designed to control the operation of a slide-out room electrical mechanism. The controller automatically stops the slide-out when it reaches it's inner or outer limit by sensing the current drawn by the motor. This eliminiates the need for the owner to hold the switch in the ""ON"" position for the entire extend/retract cycle, or installation of the limit switches and associated wiring during installation. By utilizing MONOPLEX™ System switching, only one wire and a ground lead are needed to connect to multiple switches, each with it's own indicator. The control unit can be mounted near the motor mechanism to ease installation and eliminate long heavy gauge wire runs. To operate the room, the owner would simply press the button. The indicator light will come on and the slide will move out. When the slide-out reaches it's outer most limit, the unit will sense the rise in current and switch off the power to the slide-out motor and indicator light. To move the room back again, the owner will again push the button, the indicator will come on and the room will move in. When the slide-out reaches it's inner most position, the controller will sense the rise in current and will shut off power to the motor and indicator light. If, at any time during the operation of the slide-out, the owner wants to stop the room, he can push the button and it will stop. Pressing the button again will start in the reverse direction.